More than half of fish consumed in the United States is imported from abroad yet no public health advisories indicate where the safest fish to eat are captured. Public health advisories exist for fish because of the known presence of certain harmful contaminants such as mercury and persistent organic pollutants (POPs). Advice is often given to consumers on the quantity and types of fish to eat based on broad criteria such as species and position in the food-chain. For example, fatty fish tend to have greater concentrations of POPs because they attach to fat, and fish higher in a food-chain often have higher concentrations of mercury because of its ability to accumulate up a food chain, a process known as biomagnification. Even within a single fish species, contaminant levels can vary dramatically depending on whether fish are farm-raised or wild-caught because of differences in their food and environment. By measuring hundreds of individual POPs in yellowfin tuna across global oceans, researchers have shown that another broad criterion that can be predictive of contaminant levels is capture location. Persistent organic pollutants (POPs) are man-made chemicals that do not easily degrade in the environment, accumulate in global oceans, and can have adverse health effects in animals and humans. This study measured hundreds of compounds across three classes of POPs: polychlorinated biphenyls (PCBs), previously used in electronics and as a coolant; polybrominated diphenyl ethers (PBDEs) currently used as a flame retardant; and a common class of pesticides, organochlorine pesticides (OCPs). PCBs and PBDEs have been recently detected in the deepest part of the ocean. Researchers also focused on specific POPs called transporter interfering compounds (TICs) that interfere with specific transporter proteins that help eliminate contaminants from the body. POPs were measured in the filets of 117 yellowfin tuna from 12 locations spanning the global oceans. Tuna is one of the most commonly harvested and consumed fish in the world. However, tuna like other large marine predators, act as a reservoir for POPs, and therefore serve as a main source of exposure in humans. Yellowfin tuna specifically, account for 27% of the global tuna catch. Yellowfin are found throughout the world, but are less migratory than larger species such as bluefin. 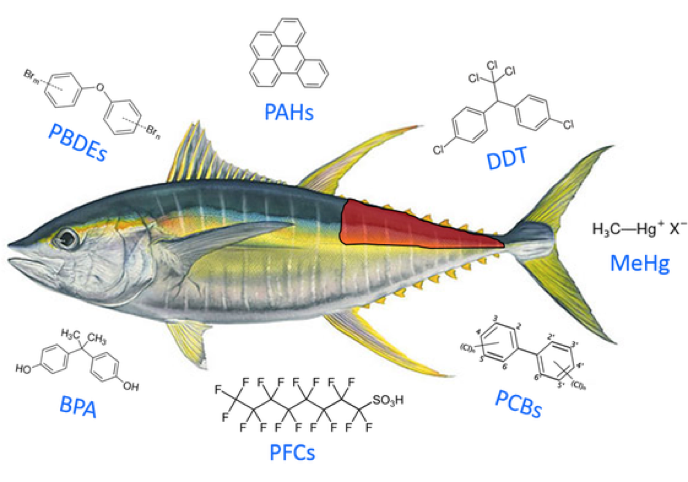 This geographic constraint allows for Yellowfin to act as a sentinel for local sources of contamination, and therefore likely reflect a wide range of POPs levels. Public health advisories currently exist for fish because of the known presence of a wide range of contaminants. Despite this, public health agencies recognize the important nutritional benefits of fish and therefore often target advisories at specific vulnerable populations such as pregnant women. Often these advisories are based on general principles related to the type of fish, their trophic position, and whether or not the fish are farm raised or wild caught. For example, the Food and Drug Administration (FDA) recommends pregnant women avoid Swordfish because of elevated levels of mercury, which is an especially potent neurotoxin to developing fetuses. Recognizing the nutritional benefits of fish, the FDA and American Heart Association recommend people consume anywhere between 7 to 12oz of cooked fish per week. However, no advisory currently takes into account regions of capture when recommending which marine fish to eat. This study uses U.S. EPA derived risk factors for the various POPs measured to calculate how much fish from each location you would be able to eat before exceeding certain risk levels for cancer. This figure is then directly compared to current FDA and AHA fish advisories. This study found that depending on where tuna were caught levels of POPs varied by a factor of 36! Yellowfin tuna caught off the coasts of North America and Europe had concentrations of POPs that were on average ten times greater than everywhere else. Whereas tuna caught from more remote areas such as the Northwest Pacific Ocean and Southwest Pacific Ocean were the least contaminated. These observed differences in contamination of tuna across catch location were greater than differences in farmed vs. wild salmon. Within each class of POPs, there were specific compounds responsible for a majority of the total contaminant burden. For example, in most regions the pesticide DDT comprised the greatest percent of total OCPs (a class of pesticides). While OCPs and PBDEs (fire retardants) varied in composition across ocean regions, the class of PCBs (coolants) had a unique chemical fingerprint across ocean regions highlighting the universal spreading of these compounds. The authors explored how these observed differences in contaminant levels across capture location would affect risk-based fish advisories. If consumers were to follow AHA and FDA recommended monthly nutritional fish intakes by consuming solely yellowfin tuna caught in the Northeast Atlantic Ocean, they would exceed cancer based risk advisories. However, yellowfin tuna from almost all other regions could be eaten in unlimited quantities without triggering a health advisory. This study shows that an additional criterion that can be important in determining the healthfulness of a fish is the location of catch. Modern day consumers often like to stay informed on where their food comes from in order to prioritize ecological and health concerns. Restaurants and markets like Whole Foods often advertise the sustainability of their fish, and whether or not they are farm raised or wild-caught, because of differences in their perceived healthfulness. This study showed that differences in catch locations might be a critical piece of the puzzle. Public health agencies could incorporate catch location into their fish consumption advisories, and labeling where wild fish are caught could help consumers mitigate their contaminant exposure. ← How much does pollution increase as cities grow? I'm a doctoral student at Harvard University with one foot in the School of Public Health and another in the School of Engineering and Applied Sciences. As a member of the Biogeochemistry of Global Contaminants Group (bgc.seas.harvard.edu), I focus on modeling the fate, transport, and bioaccumulation of contaminants in the environment with the ultimate goal of finding ways to mitigate human exposures.